Instabilities And No Nequilibrium Structures Ix (Hb): 9781402019500 Hardcover - LIMEROCK BOOKS INC. 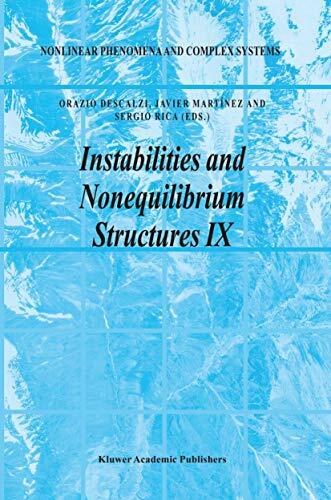 This volume contains a selection of lectures and seminars given at the Ninth International Workshop on Instabilities and Nonequilibrium Structures which took place in Viña del Mar, Chile, in December 2001. This book consists of two parts, the first one has three lectures written by Professors H.R. Brand, M. Moreau and L.S. Tuckerman. H.R. Brand gives an overview about reorientation and undulation instabilities in liquid crystals, M. Moreau presents recent results on biased tracer diffusion in lattice gases, finally, L.S. Tuckerman summarizes some numerical methods used in bifurcation problems. The second part consists of a collection of selected seminars which cover different topics in nonlinear physics, from an experimental, numerical and theoretical point of view. This book should appeal to mathematicians, physicists and engineers interested in dynamical systems, statistical mechanics, and nonequilibrium systems.